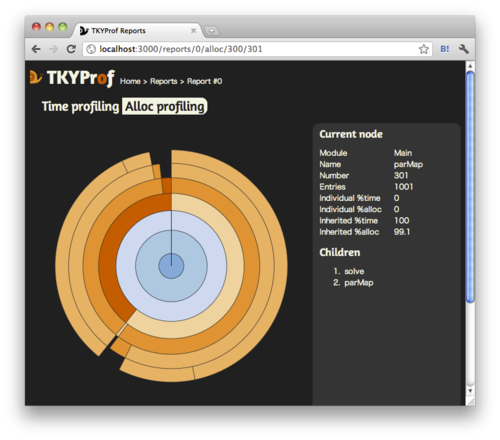 TKYProf is a web-based interactive visualizer for GHC Time and Allocation Profiling Reports. 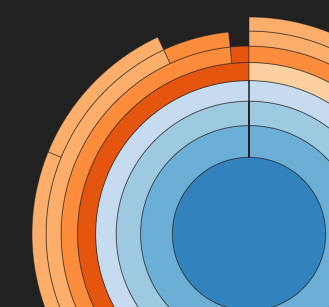 It helps you to find the performance bottlenecks of your code quickly. TKYProf uses some of HTML5 features, but does not support graceful downgrading. You need a modern browser supporting HTML5 and CSS3 for now. TKYProf is written in Haskell. Haskell Platform and Cabal are required. cabal install tkyprof installs the executable tkyprof. Run tkyprof on your terminal. Drag and drop your profiling reports. TKYProf draws a pretty chart.